Sungenia had investigated this issue before they ever installed a single system and both systems do have their pros and cons, but we decided on optimizer technology over microinverters. A summary of the reasons why we made this choice can be found in the technical report below. 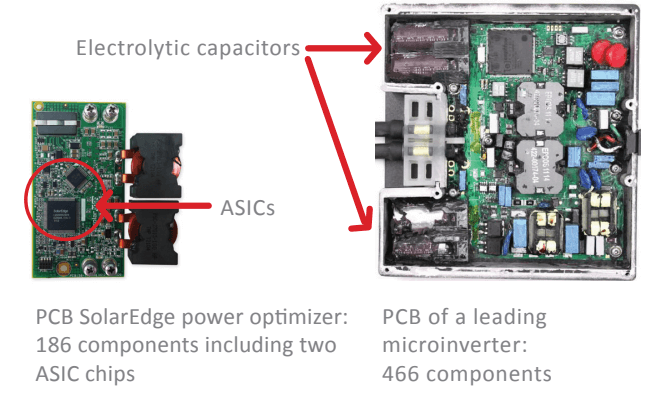 The report is from SolarEdge, the manufacturer of the optimizer we use, but frankly, we haven’t found a more concise summary and we haven’t found any other findings that would refute anything in the SolarEdge technical report. Some may feel that optimizers or microinverters are nothing more than an installer preference, however, we feel strongly that the optimizer/smart inverter architecture is the simplest, most flexible, most efficient, and most cost-effective solution for residential solar systems. As a result, of the thousands of installed units we have in the field, we have had only a single optimizer failure. Our production numbers are always at or greater than our predicted estimates. And we have never had an issue with forward or backwards compatibility.